First read the notes below and decide on what type your new Bit is going to be. you can make one quite easily. 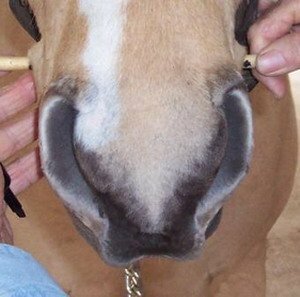 Eggbutts need to have no more than 1/4" protruding out from each side of the mouth and DOESN'T need bit guards as this type of bit can't pinch the lips. 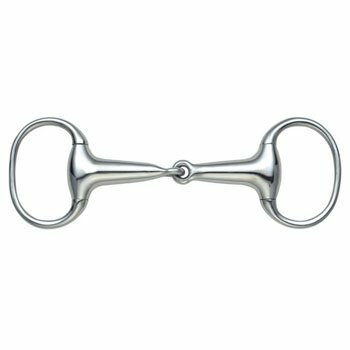 Loose ring variety bits like the one below, need 1/2" protruding out from each side of the mouth and SHOULD have bit guards as these type of bits can pinch the mouth. Now, trying to use a steel ruler or plastic or nylon tape measure is not accurate or safe so find yourself a piece of wooden dowelling about 5/8" thick and 12 inches long. 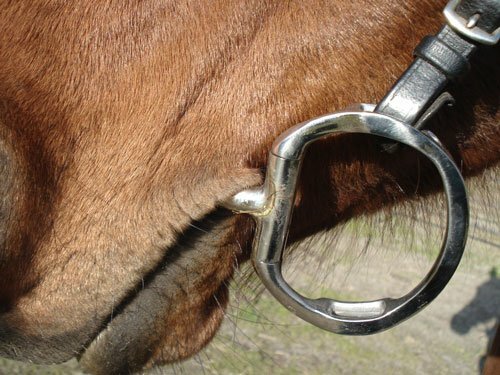 Stand infront of the horse and lay it across the bars of the horse's mouth avoiding the Tushes (canine teeth) if they have any. Mark where the edge of the lips are using a felt pen as in photo below. If the horse inadvertently bites on the wood it will not do any harm as a steel rule would do. Depending on the type of bit you intend to use lay the dowelling flat and measure between the pen marks, add no more than 1/2" for eggbutt bits and 1" for loose ringed bits this will be the size bit that you need. To measure the Bit itself you measure between the rings as in picture below, whatever variety it is, eggbutt or loose ring, you measure it in the same way.